Creamy Garlic Chicken - crazy delicious skillet chicken with creamy garlic sauce. Perfect with pasta and dinner is ready in 20 mins. Garlic Chicken is one of the best and most delicious recipes with pantry ingredients. 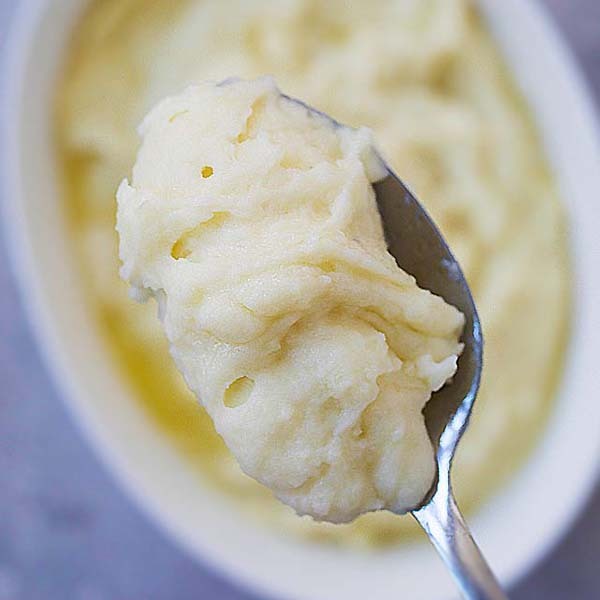 If you have a lot of garlic, frozen chicken, chicken broth, plain yogurt (or whipping cream), white wine, etc., you should be making this utterly amazing recipe for dinner! Combine the ingredients together and you will have the most amazing and absolutely scrumptious creamy garlic chicken. The recipe is inspired by this rustic chicken with garlic gravy recipe, but I used yogurt to make the creamy sauce. If you don’t have plain yogurt at home, you can certainly use whipping cream. Bone-in or Boneless Chicken Thighs? For the chicken, I used skin-on and bone-in chicken thighs, but I deboned the thighs. This will ensure that you get the best of the chicken thighs: moist, tender, crispy on the bottom but not dry, with skin and without bones. Learn how to debone chicken thighs with my picture guide and video. This is similar to how I made my chili lime chicken and chipotle lime chicken. That’s the way go to with chicken thighs, trust me on that – deboned and skin-on! 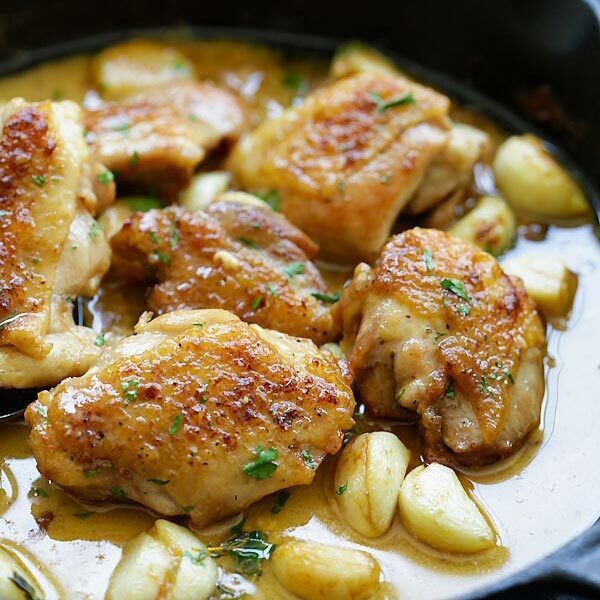 This is a super easy one skillet chicken recipe. 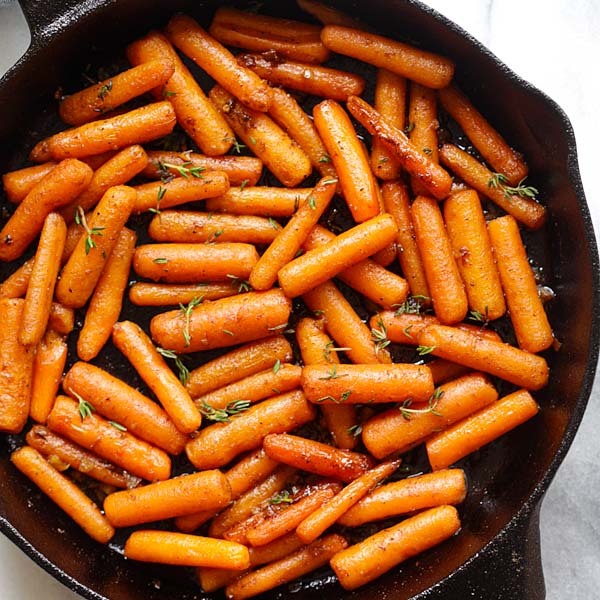 I love using my cast-iron skillet but you can use any pans (stainless steel or non-stick). I finished the creamy garlic chicken off with 1 minute of broiling in the oven to give the chicken skin little chars, which is an optional step. This creamy garlic chicken is delightful with some pasta, and they are done in about 20 minutes and you have only one pan to clean. Bon appetit! Creamy Garlic Chicken - easy skillet chicken with creamy garlic sauce made with yogurt, white wine and chicken broth. Best with pasta! Season the chicken with a little salt and pepper. Discard the chicken fat from the skillet. Add the remaining olive oil and saute the garlic until light brown. Add the chicken back into the skillet, follow by the chicken broth, white wine and yogurt. Lower the heat and let simmer. Add the thymes (if using), salt, pepper and paprika. Reduce the sauce a little bit. Remove from heat, garnish with parsley and serve immediately. You may finish the dish by broiling it in oven for about 1 minute, to char and crisp up the chicken skin. All photos and recipes on Rasa Malaysia are copyright protected. Please do not use the photos and recipes without prior written permission. If you wish to republish this recipe, please rewrite the recipe in your own words instead of copy and paste and link back to //rasamalaysia.com/creamy-garlic-chicken/. Thank you very much! This recipe is very similar to a modification of a very old recipe called “Chicken with 40 Cloves of Garlic” (although I used more like 60). As I remember, the original recipe called for putting the garlic, unpeeled, inside a whole chicken then roasting it. The modified recipe I used was done in a pan with cut-up chicken, much like this one. By not peeling, the covering allowed the garlic to almost bake inside. When you eat it, you open the outside and the garlic has turned almost to a mashed potato-like texture. Much milder than you would expect and a wonderful flavor. I made your version of the recipe and it was very easy and tasted fantastic! like most recipes I have made from this site……love this site! I don’t even know how to debone a thigh! Any videos on your site? Hi Algerine, thanks for trying my creamy garlic chicken recipe. Yeah, I love this recipe, too. Very yummy! Can I know what wine do you use? Can I use Chinese cooking wine? Hi- how do you simmer it for? Just lower the heat to simmer. About 1 minute to 2 minutes until the sauce reduces a bit. Would this recipe work well in the crock pot? Yes it would but it won’t taste as good. I will have to create a slow cooker garlic chicken. Does this dish freeze well. I was thinking of doubling it. Hi Lisa, yes, it freezes well, you can double for no problem. We tried this recipe and just used chicken stock. I didn’t have yogurt so I used sour cream and it was delicious! The sauce is so flavorful. Thanks! would heavy cream work as a substitute? im weird in that i dont like using sour cream or yogurt in my sauces. Is there anything I can use in place of the white wine? Skip it just use more chicken broth. Can I use plain greek yogurt? Tried this out last night… AMAZING! Unfortunately all my grocery store had was greek yogurt, so it was kind of hard to blend with the broth and wine. I cut the recipe and half since it was only for me. I’d eat it every week if I could! I had it with risotto and a salad. I’m so happy with this recipe! This was so good! I couldn’t find boneless thighs with skin so I used without skin, got them nice and brown and recipe delicious with mashed potatoes, I’ll try with pasta next time! Can I use beer instead of wine ? Wondering if the beer worked well or better to just increase broth… I’m Muslim so must omitt or substitute. Was thinking to try non-alcoholic beer. OMG thanks for the recipe it was SO good. Thanks Tania, glad you like it. Thank you for this recipe. I used ingredients I have never used in cooking. And my husband, who is very picky, enjoyed this very much. Thank you again. May I know if what kind of ‘white wine’ was used? It is Shaoxing cooking wine? Hi, I have tried this recipe and it is very nice. But wondering how to cook the chicken crispy and as brown as yours? Hi this looks delicious! I have skinless chicken breasts in the fridge. Will they work? This was delicious!! Thank you so much for the recipe. How does a recipe that easy taste that good? Really want to try your recipe, but due to a dairy allergy, can I omit the yogurt or is there a non dairy substitute? Try using lactose free sour cream, tastes like regular sour cream without the dairy. Hi! Your recipe is such a big hit at my dinner party… so much so I myself didnt get a chance to taste it! Have to cook this again. I substituted yogurt with buttermik though. P.s Love your Vietnamese chicken recipe too. Yummy! Hi Intan, thanks so much. Buttermilk is a great idea but next time try with yogurt, this creamy garlic chicken is so good! Looks great! I’m going to try this tonight. Do you cook the chicken through when it first goes in the pan, or do you just brown it and then let it cook through during the simmering process later in the recipe? Yeah, let it cook through through the simmering. I gave this a try. Chicken with garlic is pretty much a staple in my house. It came out pretty well and was easy enough to execute, but there seems to be a problem with using yogurt. What I found was that the milk solids didn’t dissolve and left a coarse pebbly residue in the sauce that defied all attempts to break them down or reduce them. They didn’t impact the flavor profile, but were not visually appealing. I don’t cook with yogurt that much, did I do something wrong? Hi Keith, hmmm, was your yoghurt fresh? It sounds like it cuddles. You can add it and stir in after turning off the heat or you can just use whipping cream. i used sour cream n it came out amazing! Don’t have whole garlic is minced okay? I haven’t tried this recipe yet, but I will be. However I do have a suggestion for those having a problem with the yogurt. Put the yogurt in a bowl and gradually add the broth, whisking constantly. When you add it to the pan it doesn’t curdle or separate. Hi Polly thanks for the idea. Hi, I tried this recipe last night, it was so easy and DELICIOUS! The whole family loved it, it’s always a good sign when everyone asks for seconds! I used heavy cream instead of yogurt, and skin-on drumsticks as I couldn’t find boneless thighs. We loved the sauce over rice, and I wondered how to increase the amount of sauce without changing the taste / consistency… Would we add more quantities of all the liquids? Or just the broth? Thanks! Hi Lisa, yes, this is an amazing recipe, you should try yogurt the next time it makes it even better. You can just double the sauce! Thanks for trying my creamy garlic chicken recipe! My husband prefers bone in/skin on split chicken breast over thighs. This would take longer to cook as opposed to boneless thighs. Do you think I could increase the simmer time to cook the chicken breast without scalding the sauce or changing the consistency too much? Tried this tonight and unfortunately we did not like it. The sauce was more liquid than creamy. Was really forward to this dish but was disappointed. I am sorry that you didn’t like this creamy garlic chicken recipe. Did you use yogurt or cream? I prefer lightened up version of creamy so it’s not so rich. I don’t see any cooking times on your recipes. They look so delicious I’d love to try them but have no idea how long to cook them. Like this recipe you say to simmer the chicken but you don’t say how long. 10 minutes? 20 minutes? I wish I knew. I’d also like to try your garlic potatoes but again, there is no amount of time to cook them for! I’ve notice that with most of your recipes containing chicken, you recommend “deboned, skin-on” (LOVE chicken thighs) how would you debone them though? Also my boyfriend isn’t a big fan so I’m usually making boneless skinless chicken breast, however, I slice each one down the middle so it’s not so thick. Should the recipe come out just as good or are there any small changes I should make? Hi, first of all: I Love the recipe. Thank you so much for sharing! 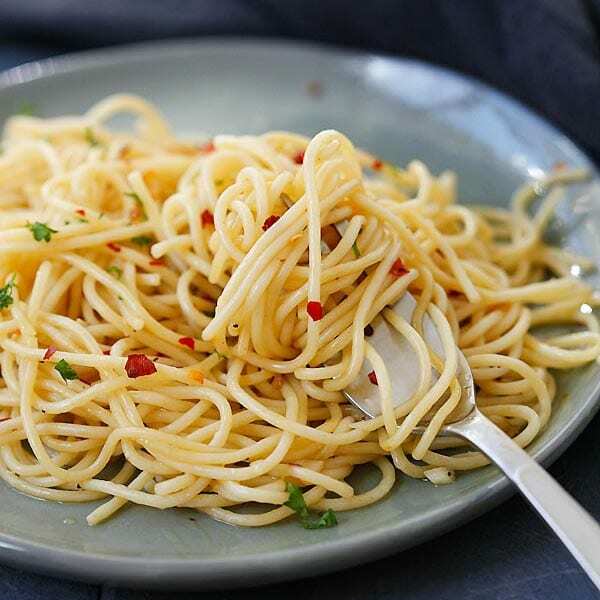 You saved many family dinners again and again with your recipes: this one was a huge hit with both my husband and son, and they are SO picky. That’s why the other day I tripled the servings for the creamy garlic chicken, because it wasn’t enough for my family, problem was, even though I double checked every ingredient the sauce turned out liquid and with no flavour. Was it because I tried to cook everything at once? I did try to simmer it a long time, on a huge skillet, but it wasn’t the same. Should I cook as the recipe says, and when finished do it again, as “batches”? Also, I’ve been wondering, are the measurments US cups? All this time I used imperial cups…thank you very much for your time. Why discard the flavorful chicken fat (schmaltz) then add back (comparatively) bland olive oil? Schmaltz is a traditional cooking fat that carries great flavor, especially when using skin-on bone-in thighs. More garlic – garlic and savory foods are made for each other. I used sour cream, a traditional route to a creamy sauce. And I spooned the sauce over fresh pasta. I made your recipe exactly as written and it was quick and delicious. This will be on regular rotation at my house. Thank you! Thanks Elaine for trying my creamy garlic chicken. I did not debone thighs so they took way longer to cook. I need to learn this. Sorry, the sauce was not at all creamy. Used plain yogurt like you said. I mixed the broth, wine and yogurt together then added to skillet. Not sure what I did wrong. Can i replace the white wine to red wine or chinese( sau xing wine )? Thank you for this recipe. Its easy to make and tastes fantastic. I made it with sour cream instead of yogurt the 2nd time round and the family agrees that it taste more flavourful with sour cream. We are love this and will be making this often. We had it with white rice and can’t wait to try it with pasta. Awesome, I will try sour cream! Thanks for trying the creamy garlic chicken. Can this be modified to cook in the instant pot? If so how would you advise to modify the recipe to suit the instant pot? …mmmmm, nice, this look delicious. Where’s the recipe?? ? Ingredients list???? Recipe steps….. It’s gone…. Did you scroll down? The recipe is there!